John Macbeth, a Scottish postgraduate student today took possession of his new home, Dunderave a 1965 South Coast One Design. 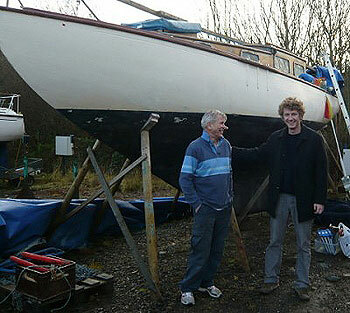 The previous owner bought her in 1992 and has sailed her extensively on the West Coast of Scotland. Now she is headed to Stornoway on the Isle of Lewis with John who intends to live on board whilst working on the island, and to have her ready for sailing in his spare time as well as use her to get around the islands as he works. In the New Year break, John and a team of friends will be working on her, getting ready to go in the water in January so there might just be an unusual Hogmanay celebration this year at Kilmelford Yacht Haven! We're delighted that Dunderave is going to a new life with someone as enthusiastic as John and wish him all the very best of luck for the future.